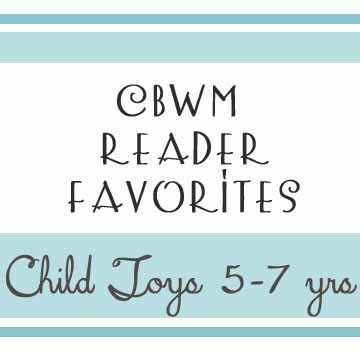 For this post, share your favorite toys for children 5-7. My 5YO son is currently loving the Leapstar , Thomas the Tank Engine wooden train set (he has just started making the tracks by himself), lego sets , mobilo , musical instruments (small drum set and guitar), swing set, trampoline and sand pit. There are many other things, but he seems to keep coming back to these. My six-year-old son loves anything and everything Lego. It’s an obsession. Besides Legos and other building sets like Trio Blocks Fisher-Price TRIO Building Set with storage and wooden blocks, I like having an extra-large pad of paper on hand and high-quality markers and paints. He is at the age where drawing is fun and I like to encourage that. We have the Crayola 50 ct. Washable Super Tips with Silly Scents Crayola 50ct Washable Super Tips with Silly Scents and it is fantastic. He has started to love “funny flip books.” I’m not sure what to call them other than what this blogger calls them: https://playtowrite.wordpress.com/2012/01/31/funny-flip-books/ He has a homemade one very similar to the one shown in the post. My kids adore Playmobil toys. They have literally everything under the sun in mini. Check out amazon.com! The stuff is very strong, lasts for many many years; I grew up playing with it too. It’s the kind of thing that you could collect as a family, relatives can give additional sets for birthdays/Christmas, etc. There are sets from $8 all the way up to hundreds of dollars.